Event will comprise three separate but inclusive activities, all intended for maximum impact. 1. On Mon June 24th, a promotional display will be set up at the location towards assuring a good attendance at the opening on Fri June 29. 2. Opening event scheduled for 3 hours will comprise a demonstration of the batik techniques by the participants and viewing of the works produced by participants during the workshop. Public will also have the opportunity to interact with program participants. 3. The exhibition on display will remain in place for additional viewing until July 6 2018. 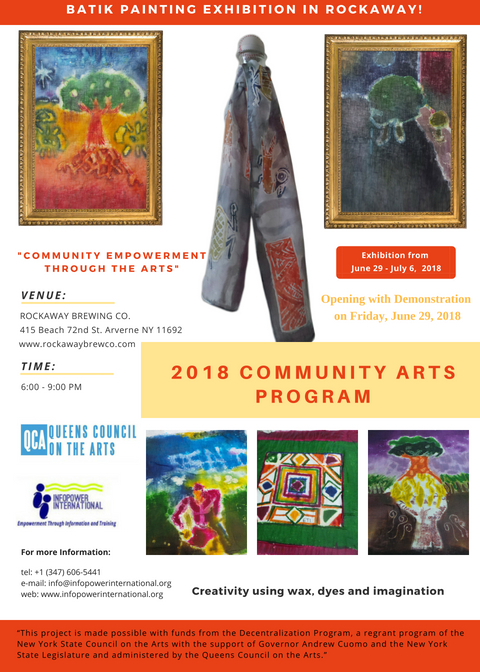 Opening and demonstration: June 29th 2018 Fri 6pm - 9pm. Exhibition continues till July 6th 2018.